Princess Vlei tells the story of much that is wrong with our city. But it also holds the promise of a different city: A city not riven by class, colour, culture, language, and creed. A city that makes access to natural beauty and environmental health a right for all, and not just a privilege of the wealthy. A city that honours and nurtures our rich wealth of biodiversity. Cape Town is scarred by years of politically manipulated or short-sighted planning. This has damaged our social systems, by entrenching social, cultural and economic divisions and inequalities. It has also damaged our natural systems - fragmenting eco-systems, cutting off the migratory paths of animals and pollinators; the waterways have been polluted, clogged, damned, canalised, forced underground, drained, and built over. Our lives are shadowed by poverty, fear and violence; our fragile natural systems are pressured to the point of collapse. Our hope lies in recognising that we cannot live in isolation, walled off from nature and from each other. We are interdependent. If our eco-systems die, so will we. If our fellow citizens are forced into lives of grinding poverty, we all bear the shame. Our hope for a peaceful and prosperous future shared by all depends on transforming our city into a collaborative and healthy socio-ecosystem, that enables us to live in harmony with nature and with each other. And the Princess Vlei is uniquely placed to play a powerful role in helping us to realise this vision. Because of its history, its mythical connections to our past, its physical location on the cusp of the divisive lines of our city, as well as the nature of its eco-systems, the Princess Vlei provides an iconic space where people may come together and benefit from the restorative power of nature. It offers a place to come out of our respective walled communities, and learn more about each other; a place in which to play, to pray, to get fit, to create, to heal, to learn, to teach, to remember, and above all celebrate both our diversity and our common purpose. The children who plant learn lessons of long-term planning, of growth, of taking actions for the benefit of others. The creators of the dream catchers and bird puppets have learnt the values of collaboration, of creativity, of pursuing common dreams, and honouring our natural heritage. The children sailing yachts on the waters learn about team work, discipline, and responsibility. They are pitting themselves against physical challenges, taking risks in a healthy responsible and managed environment. Every single organisation and individual who has engaged in helping to save the Princess has learnt about making themselves heard, and about exercising our democratic rights and responsibilities. One project inspired by the Princess and other iconic landmarks is the ‘Changemaking, Deal making, Spacemaking’ project by team of Swedish architects and landscape architects from the Royal Institute of Art, Sweden. Find out more about this here. 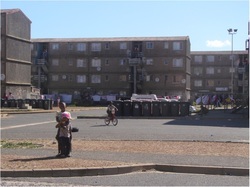 Many of the areas around Princess Vlei are bleak, concretised housing estates. The children growing up here have no contact with nature. This is destructive for them emotionally, and devastating for our planet. An area such as Princess Vlei can be a invaluable as an ambassador for nature, reconnecting urbanised communities with nature and instilling the love and knowledge needed to protect our environment in the long term.